In his second inaugural address, Providence Mayor Jorge Elorza spoke about housing, the City’s financials, the dropping crime rate, PVDFest and much more. What he did not talk about was his controversial plan to ‘monetize’ the Providence Water Supply Board. Tomorrow, at 2:15pm in room 311 of the Providence City Hall, the Providence Board of Contract and Supply will open the RFQs submitted by companies interested in leasing Providence Water as part of a public-private partnership. You can see the RFQ here. 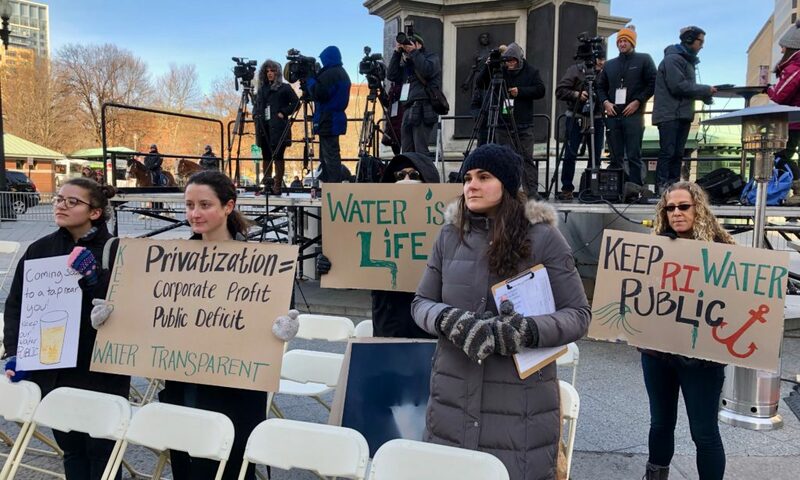 At Elorza’s inauguration on Monday, eight activists held signs, distributed flyers and collected signatures in opposition to Elorza’s plan to lease the water. 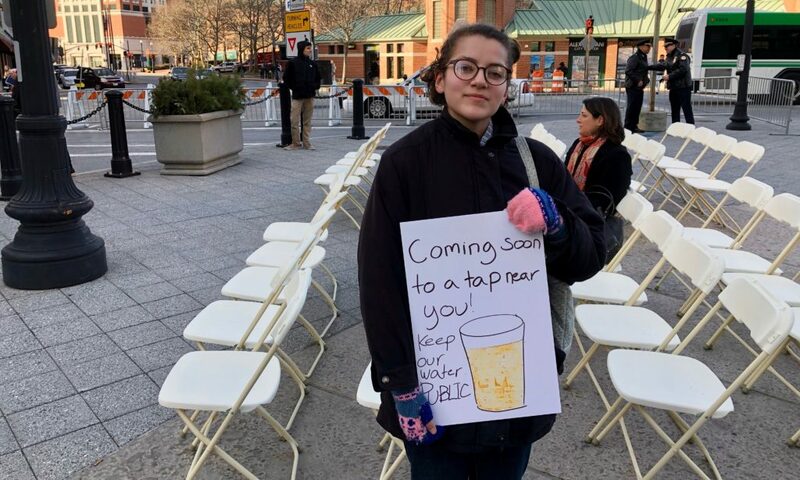 “Selling the rights to water is always a bad idea,” said protester Nicole DiPaulo. “It is not a sound argument to say that the investment would be profitable without either a. cutting costs in the form of labor or quality, or by commodifying water through bottling or selling to a company–like say Invenergy, that is seeking water to cool the turbines of a fracked gas powerplant that they are trying to build for massive profit. The people always lose when our shared resources are exploited. When public water systems are sold or leased, it more often than not has significant, negative impacts on water quality. 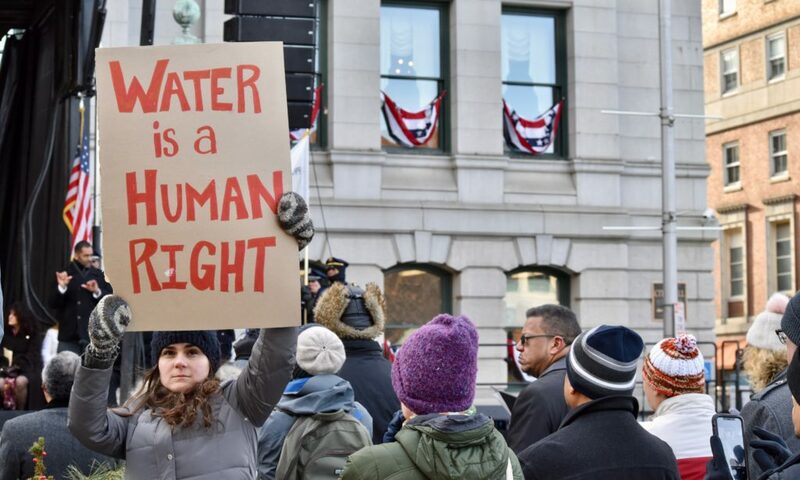 It can lead to rate hikes, labor cuts and abuses, the selling off of wetlands, the industrial and commercial exploitation of land surrounding the water supply, and reduces needed investments in infrastructure. Last year Elorza was seeking the advice of Steve Goldsmith, former Mayor of Indianapolis. Goldsmith did a water privatization deal as Mayor that cost the city plenty of money to get out of when rates went up and water quality went down. Goldsmith is associated with the Manhattan Institute for Policy Research, a conservative think tank that promulgated privatization and supply-side economics (aka trickle down) in the 1980s. Goldsmith, thankfully, is no longer advising Elorza, said Providence City Solicitor Jeffrey Dana. 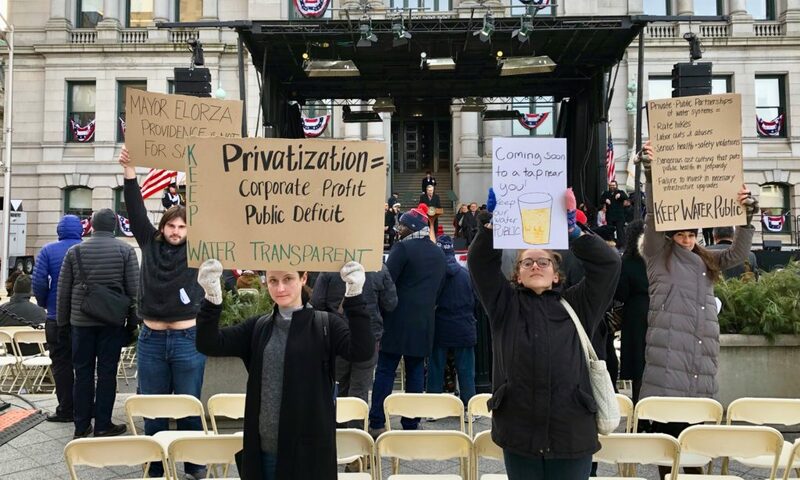 Elorza decided to lease the water after a report from the National Resource Network suggested the idea as a way to plug the pension hole. (See pages 81 – 84 at this link.) Notably, the same report contains many other suggestions to raise revenue in Providence. Few of the suggestions are being pursued with the same vigor as leasing the water.